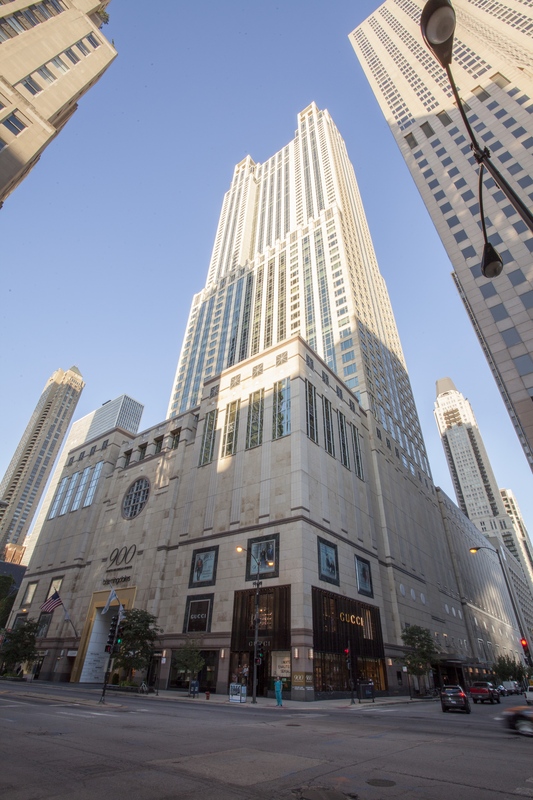 The 900 North Michigan Shops in Chicago, IL has been an anchor of the Magnificent Mile since the building was completed in 1988, and the luxury mall recently underwent a renovation process to modernize both exterior and interior spaces. 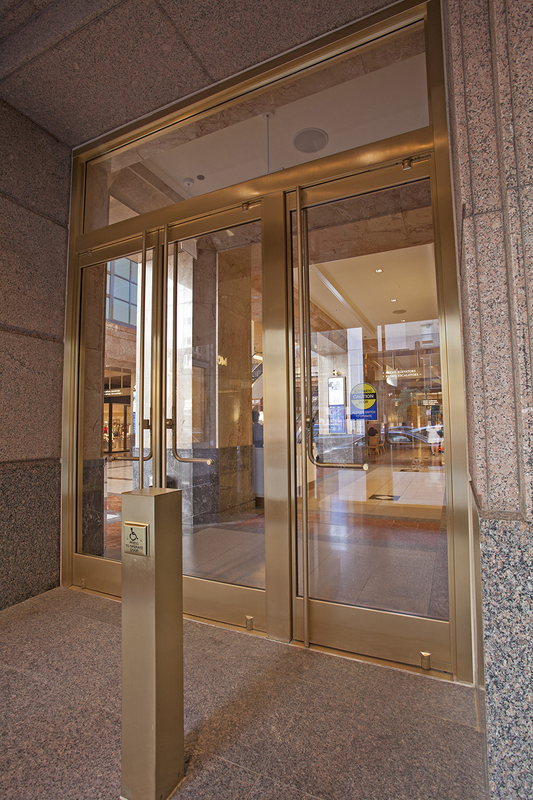 To complete the main entrance redesign on North Michigan Avenue, Ellison Bronze custom balanced doors provide the perfect complementary entrance to the central revolving doors. In an age of digital purchases and online shopping, it was important to make an impact on the street level to draw in shoppers and enhance their experience. The redesigned bronze and glass entryway stands 37.5 ft. tall, featuring white laminated glass that displays the names of retailers, making them visible to passersby. 900 North Michigan is a 465,000 sq. ft. property with seven levels of luxury shopping, including retailers like Gucci®, J. Crew®, and Michael Kors, and anchored by Bloomingdale’s. The luxe shopping complex also features excellent dining options, three spas, and two fitness centers. 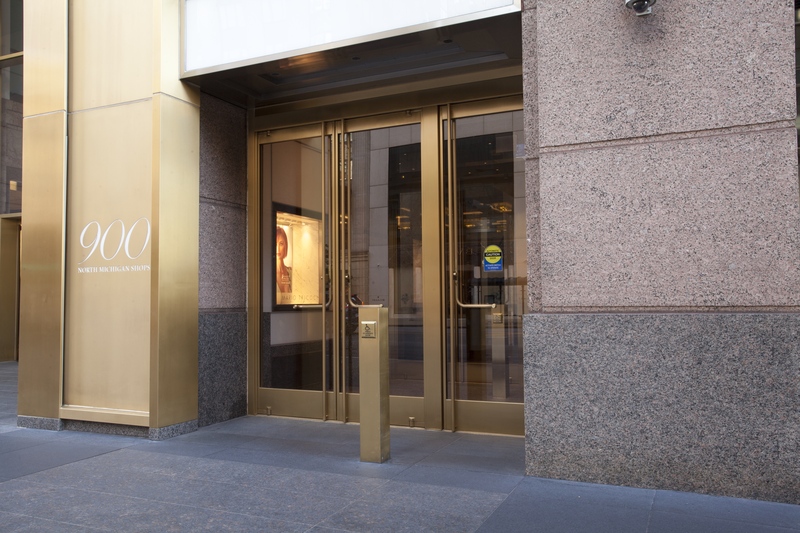 Manufactured from muntz bronze, a total of six Ellison balanced doors are installed at the entrance vestibule positioned to the right of the revolving doors. Both the exterior and interior Ellison entryways feature a pair of narrow stile tempered glass balanced doors, in addition to a single balanced door. The doors feature 4-3/4” high top rails, 10” high bottom rails, and 1-5/32” wide stiles, and are completed with ½” low-iron tempered glass factory glazed by Ellison. The interior entrance features a bronze and glass transom above the doors, expanding the open space around the frame. 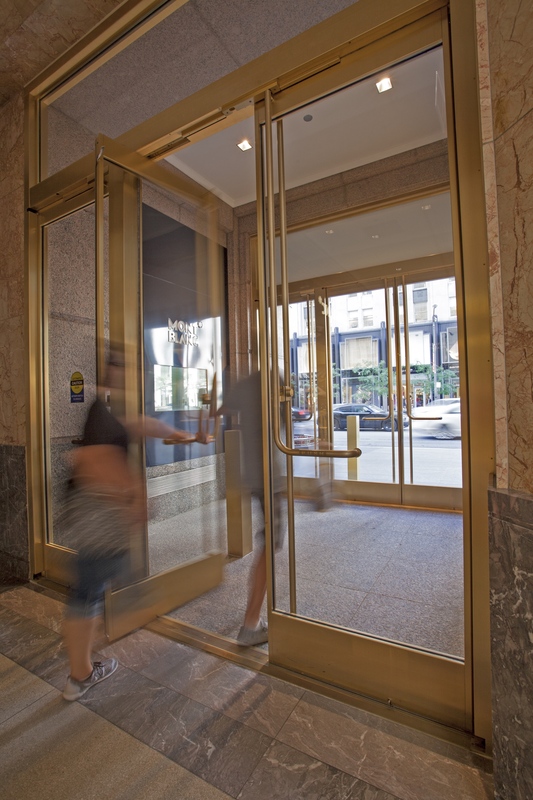 The single doors are equipped with Ellison PowerNow® Stanley® Magic-Force™ low-energy concealed overhead power operators with push plate activation, making 900 North Michigan Shops compliant with the latest ADA standards for public doors and entrances. Ellison’s balanced door design is important for areas of heavy foot traffic or where sidewalk encroachment may be a concern. The inset pivot point located at two-thirds the width of the door reduces the amount of clearance needed when opening. In addition, the doors are much easier to operate because both external and internal pressures—wind loads and building stack effect—are significantly reduced at both sides of the door leaf. 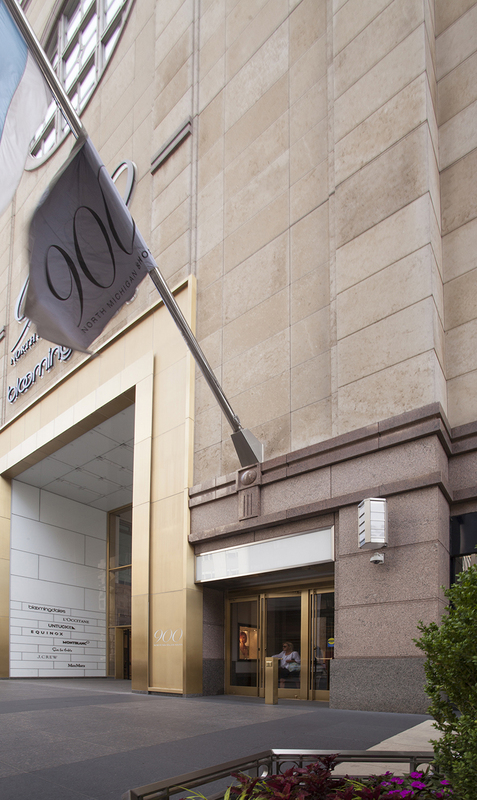 The original entrance featured dark marble and metal materials that had an aged, lackluster appearance. 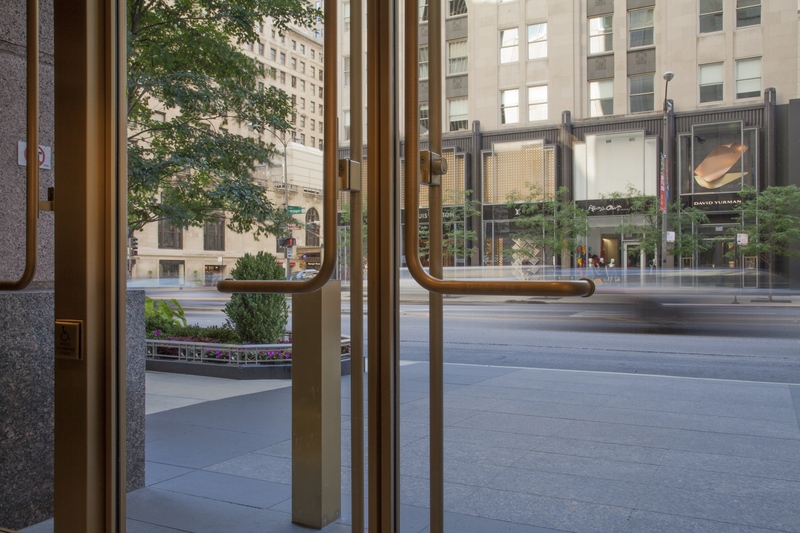 The new front entrance portal affirms 900 North Michigan’s commitment to the Magnificent Mile with an open, inviting aesthetic. The renovations have redefined the world-class shopping center as a major attraction for the city of Chicago. 900 North Michigan Shops was completed in fall 2017. The project team included contractor MTH Industries and architect OKW Architects.